Ispra, Italy. This example shows highly adaptive SAR image processing, taking into account the clutter first and second order statistics as well as the impulse response function of the SAR imaging system. It is possible to simultaneously remove speckle noise and to preserve (and even to enhance) the resolution of a SAR image. On the Upper Left, the 3-looks ERS-1 image of Ispra (Northern Italy), centered around the EURATOM power plants and facilities. On the left side of the image, the shores of the Lago Maggiore are difficult to delineate, due to the speckle noise. 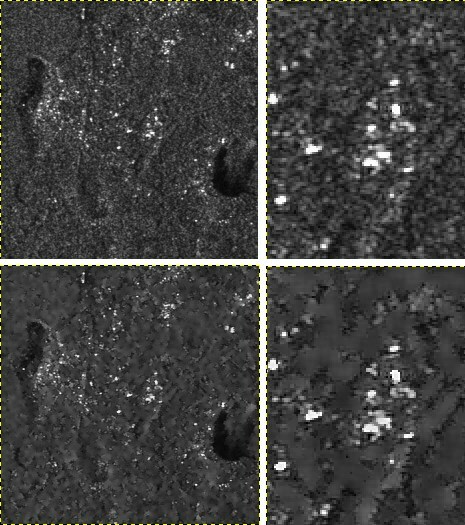 On the Bottom Left image, after speckle filtering using an Improved Gamma-Gamma MAP speckle filter (developed by PRIVATEERS NV) exploiting the second order statistics of both the clutter (imaged scene) and the speckle (imaging system), the shores of the lake appear clearly. It is also clear that the bright responses of point targets (buildings) have been extracted from the clutter, and preserved. The original (speckled) image (Upper Right) and the filtered image (Bottom Right) showing the installations are zoomed. The responses of the buildings, which have been focused by deconvolution from the impulse response of the SAR imaging system, are at the same time denoised and accurately located. Since the original pixel size is 12.5x12.5 meters, and the original image resolution of 22x25 meters, the process performs resolution enhancement without the need for resampling. The installations are located on a very hilly terrain, and are cluttered by forest patches. Even in this difficult case, the resolution achieved in the filtered image is better than 18 meters.